Hi, my name is Arias. I am a very sweet girl looking for my forever home. My foster mom says I am the sweetest shar pei for having the life I had. They found me in a swamp. Someone had left me there and I fended for myself. But, now I am in a foster home with beds to sleep on and lots of food and treats. And air conditioning. I like the air conditioning. I am a senior lady but I still have a spring in my step. My vision isn't the best but I can find my way around. And I definitely know my food bowl since I move it around when I'm hungry. Just so my foster mom knows. 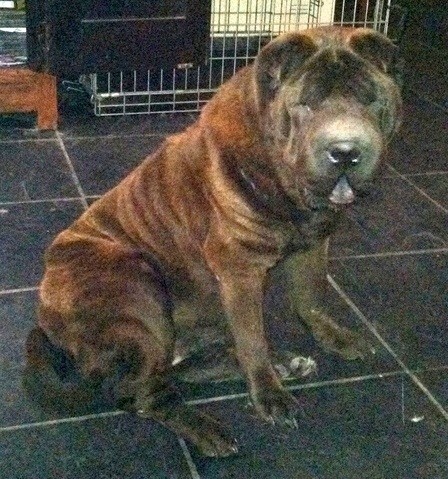 I'm looking for a forever home where I can hang out and be your numero uno shar pei. Love, Arias.